While the ad shows Tobor picking up his module, many kids complained that one of the first things to break was the robot’s arm. It was 1978 and this little girl was begging for a cheap hunk of plastic that used loud noises and a remote control to operate. It was Tobor – the slogan will forever be imprinted in my mind, “tobor is robot spelled backward”. I have fond memories of decorating my little black robot with accompanying stickers, and guiding him around the living room. My fun was short-lived, though. Partly because he wasn’t as exciting as I’d expected, and partly because he couldn’t stand up to hitting anything. Tobor broke quite easily and was difficult to control. I was frustrated because it was too hard to get him to pick up his space module. Not long after Christmas, tobor could be found upon a shelf in the basement, amidst other toys us kids had grown tired of using. And Tobor wasn’t cheap. In ’78 and ’79 his price range was $13.99 to $22.99 (the higher-end the store, the more Tobor cost). 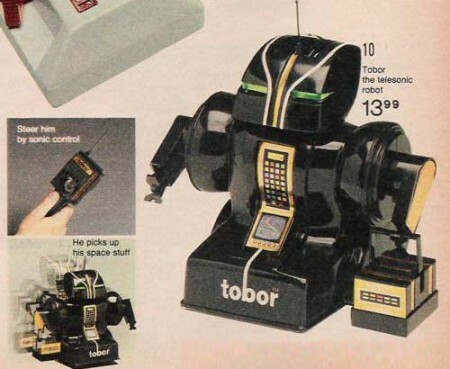 In 1980, many stores were clearing Tobor out for $5.99 or less. Now, ask yourself – is there any way the children in that commercial were actually operating Tobor? I think there’s a man or two off-camera using a more sophisticated method to move him across the floor, because even my father couldn’t get this robot to behave. Do you remember Tobor? Did you find him as frustrating as I?